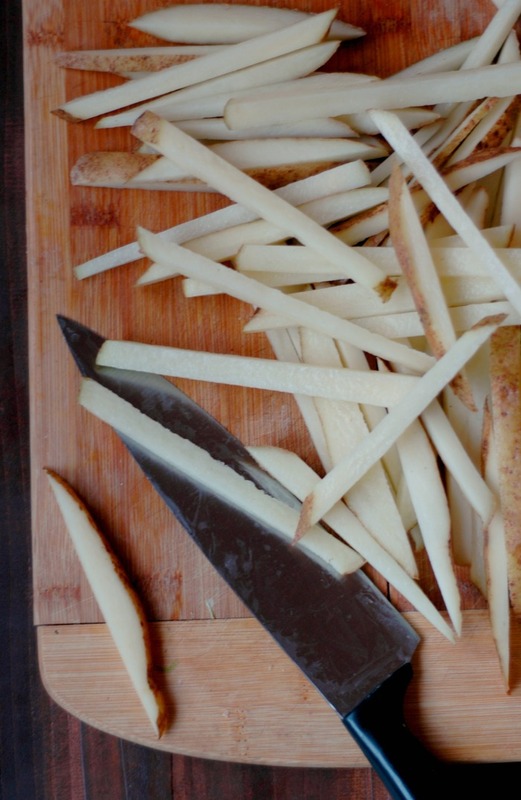 Paleo Fish ‘N Chips :: Quick Sheet Pan Prep! Crispy and flavorful paleo fish ‘n chips are the perfect family friendly dinner menu idea made healthy! As far as my childhood goes, and probably many in my generation, that was definitely the extent of most kids’ exposure to fish. I don’t think I touched a piece of fish from the time I was a teen until my mid 20’s when I learned better, and boy I am determined to change that! While I know beyond a shadow of a doubt our generation’s parents were just doing what they thought was best (fish is healthy right?! ), those boxed fish sticks were pulled from questionable sources, and the breading…well, let’s just say the mile long list of ingredients probably didn’t do any of us any good! More and more of us are becoming more conscious of fish sourcing importance, as well what the toxins and ingredients in processed foods do to our health (liver overload, every autoimmune disorder imaginable from Hashimoto’s to RA, Chron’s, and IBS all have roots in toxins from our environment and food). So what can we do when we just want to have something fun like fish and chips from our childhood? 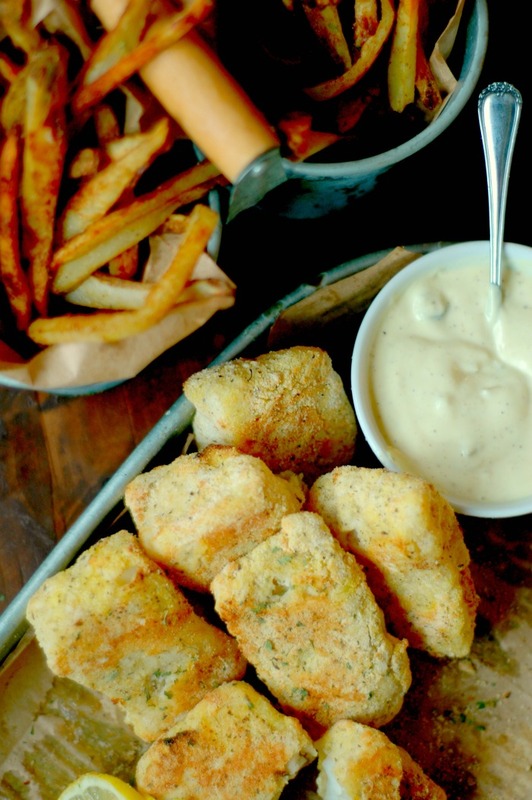 Give those fish and chips a real food makeover, of course! Sure it’s not as fast as a box of fish sticks dumped onto the tray, but I gauruntee this preps faster than you think, *and* here’s the kicker…over time, those boxed fish sticks will wreck havok on your digestion. Making your own won’t be overloading your body with foreign food-like chemicals and ingredients which means you’ll feel better! Sheet pan prep fast and oh so good! 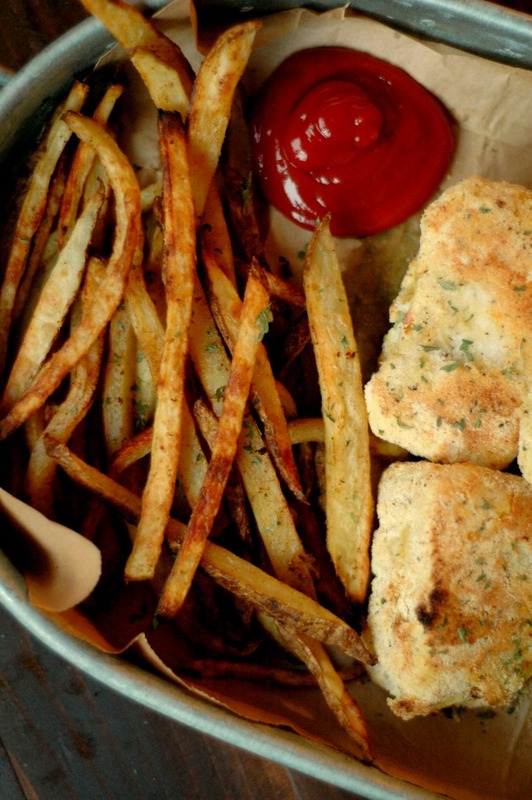 This crispy fish is super fast to bread up and the fries get so crispy with minimal effort! The trick is all in the oven temp and cook time! I love using this organic all seasons salt to season the fries – it seriously tastes just like a restaurant! Such a treat! 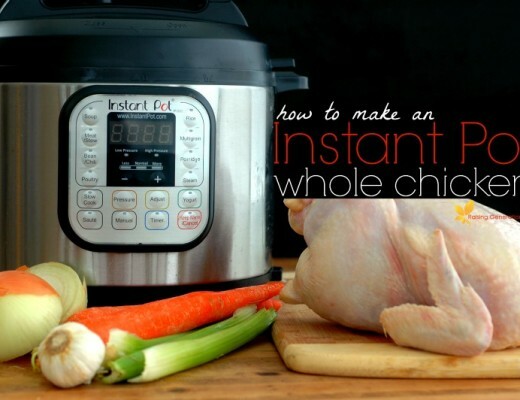 This busy momma knows that taking the time to make dinner sometimes just doesn’t happen. That’s why those boxed fished sticks from the store became so popular in the first place, right?! So the next time you stock up on some wild caught fish, take a 20 minutes and bread up a bunch of fish for the freezer. You can get them all coated up, put them on a sheet tray into the freezer for an hour, and them pop the frozen breaded fish into a bag – they will pull out of the freezer just as convenient as the boxed kind! Super quick veggie sides for fish ‘n chips! Steamed frozen veg – just dump the bag in, steam, and add butter! So fast! Wild caught fish is always best. We have a local fish monger that sells wild caught cod and salmon sometimes, but my main source most of the time is actually Costco. Their freezer section has great wild caught cod and it is always there! The health benefits of wild caught fish versus conventional/farm raised fish is vastly different. 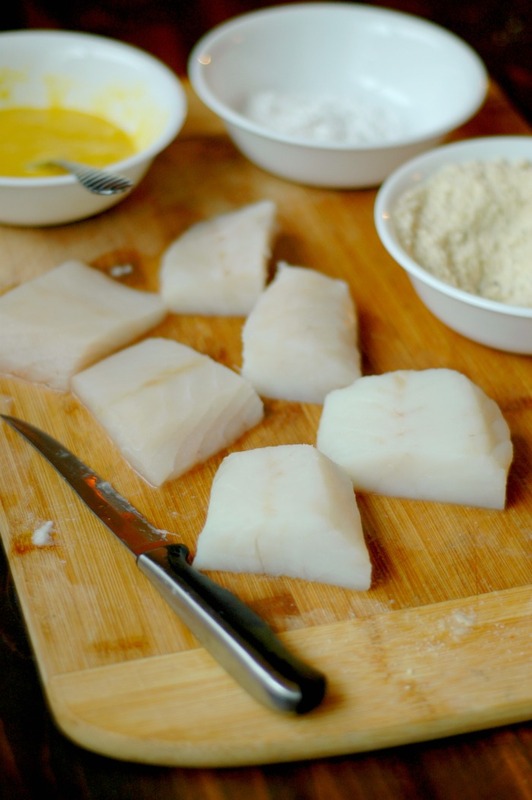 Cod is a great source of fat for brain development, so it is a nice meal to get your littles used to from very young. (You can read more about how to introduce babies and toddlers to fish in my cookbook, Nourished Beginnings). I hope this recipe brings back a little bit of childhood to you! Paleo Fish 'N Chips :: Quick Sheet Pan Prep! Crispy and flavorful paleo fish ‘n chips are the perfect family-friendly dinner menu idea made healthy! Pat dry the sliced potatoes as much as you can, place on a large baking sheet, and toss with the avocado oil and seasoning salt. Put the tray in the 425 degree oven for 15 minutes. Stir the fries around and bake another 15 minutes. While the fries are baking, you can prepare the fish. Sea salt the cod fillets on both sides. Put the potato starch in one bowl, whisk the egg and mustard in a second bowl, and whisk the almond/coconut/rice flours, garlic powder, and Italian seasoning in a third bowl. Coat one of the cod fillets in the potato starch covering all sides. Dip in the egg/mustard, and then coat with the seasoned almond flour mixture. 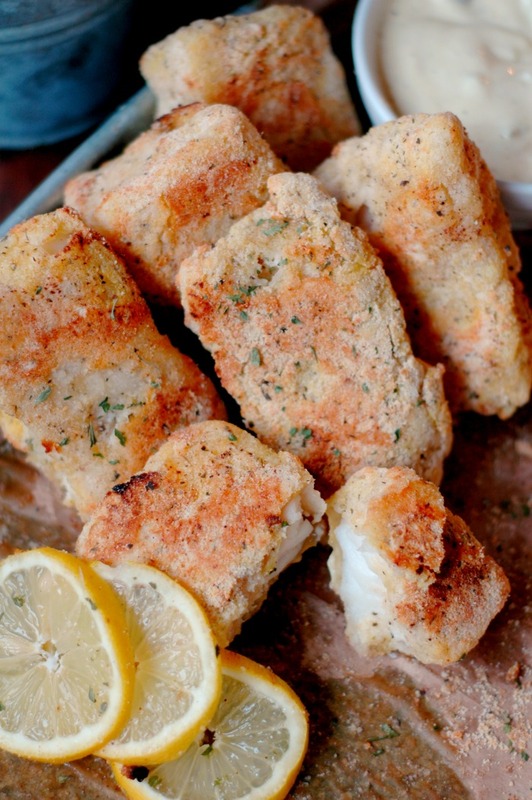 Place the breaded fillet on a baking sheet, and then continue to bread all the cod fillets. (If you aren't making as many cod fillets, you can just bread the fillets and set them on the same baking sheet as the fries when it is time to bake them). 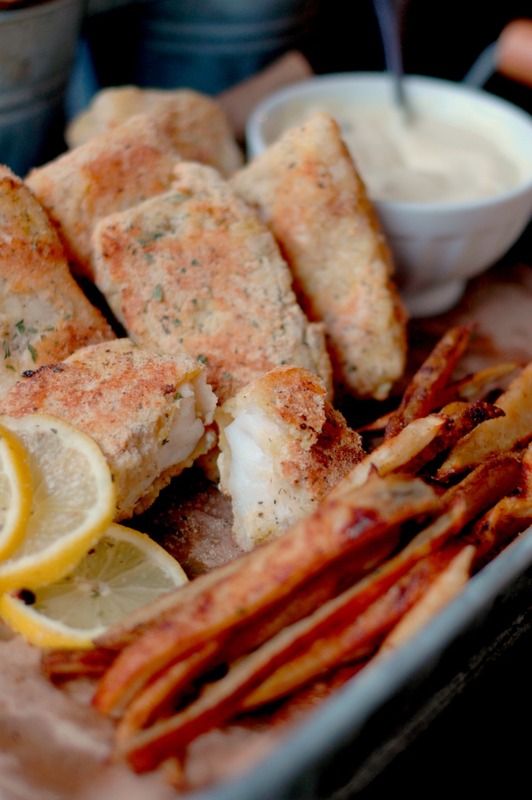 Once the fries have baked for 30 minutes (15 minutes, stir, 15 minutes), put the breaded cod fillets in the oven and bake both the fish and fries for 15 minutes. Put the fish right under the broiler for 2 minutes, flip the fish, and broil another 2 minutes. 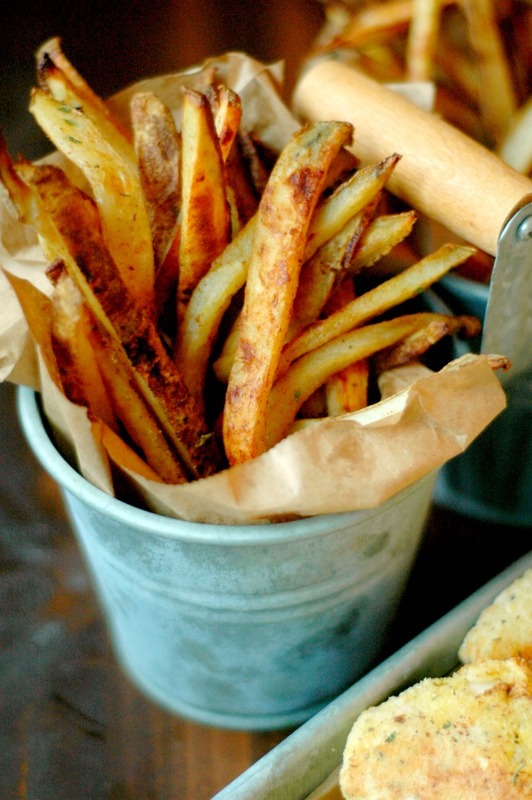 The fries can just hang out in the oven while you broil and crisp up the tops of the fish. 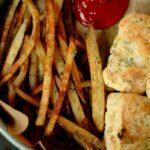 Serve your fish with lemon wedges and homemade tartar sauce (there is a recipe in my new cookbook, Nourished Beginnings), and your fries with your dipping choice such as organic ketchup! Yes! I hear you on that! The kids will love the fries! Oh this looks so nice! As a Brit, I know all about fish and chips. Every evening after the gym I have to bypass so many fish and chip shops, it’s painful. I am definitely going to cook some of these up as a treat! 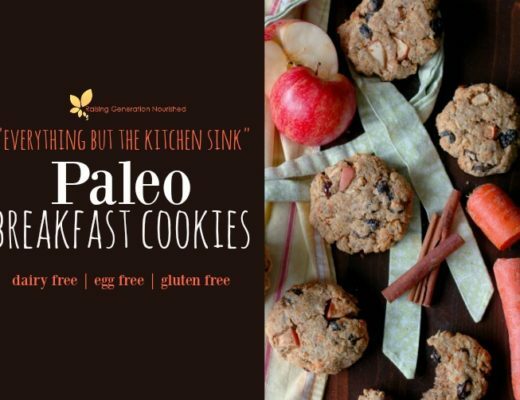 Can’t wait – Great recipe! Fish and chips are my mom’s absolute favorite! Will definitely have to make these for her. And I love that they’re in a sheet pan, so super easy to make too! Great recipe! Sheet pan dinners are all the rage right now and I am so loving it! This meal looks so comforting and I can’t wait to make it. Nothing quite beats the fish and chips combo. I got the biggest eyes when I saw this! It looks SO good!!! I really miss potatoes and know I would have devoured those fries and that beautiful breaded, crispy fish if I could have them! My family would LOVE this meal though. I’m going to have to make it for them. Fish and Chips are my husbands favorite. Pinning this one to make for him, he will be sooo stoked! I love that you made this a one pan meal- so amazing! This looks easy and so delicious! Added to the menu for next week!! You combined 2 of my favorite things! I can’t get enough of fish and chips, and you just can’t beat sheet pan meals! Nommmmmm mustard-crusted fish! Love it. I love fish and chips ! I’m totally going to make this dish ! YUM !! My hubby loves fish and chips. I may have to make this for him. Looks delish! Fish and chips happens to be one of my most favorite meals of all time. Thanks for sharing this great meal! I’ll have to make this for my husband soon! Looks so tasty. I was only craving some today! I’ll have to make this tomorrow now especially as I have all your ingredients. These look WAY better than any fish stick I’ve ever had! Can’t wait to try. Hi Ole! What makes you say the it is misguided? I am making your fish and chips now and just realized I do not have the organic all seasons salt. Can I substitute something else? Hi Cathy! You can use whatever seasoning you love! Poultry or fish seasoning blends, or just an Italian blend works too!